Clothing brand ENSEMBLES just recently launched the 3rd installment of their designer series. This time the spotlight all goes to the very talented designer: Louis Claparols. Ensembles model/brand ambassador: Carmina Villaruel. 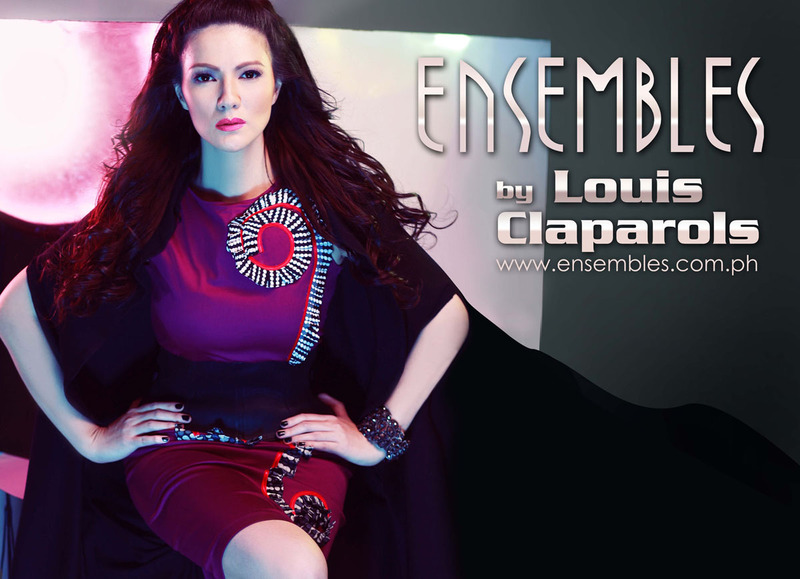 Louis Claparols (pronounced as Louie) is one of the most celebrated fashion designers today. He’s the elected president of Young Designers Guild (YDG), he once co-owned a vintage store in Rockwell called Marni’s Room, and is now collaborating with Ensembles for a capsule Holiday collection. He rose to fame with his collection of embellished jeans which further evolved to making sportswear-inspired clothing. But he always surprises everyone at every fashion show he’s part of and shows the audience something new. “I grew up with a very chic mom. And I believe Fashion is in our blood”, Claparols recalled when asked how his interest in fashion design began. He has female cousins who were top models in the 80’s and a brother who’s a famous bag and accessory designer in New York. • If you weren’t a fashion designer, what would you be? • What’s your happy pill? • How will you spend your Holidays? • What do you spend your time on aside from designing? Claparols Holiday 2010 Collection for Ensembles consists of very art-deco dresses, tops, skirts, boleros and trench coats. Each piece in this special pocket-collection features distinctive retro-feel prints made into cut-out patch detailing that one can see how intricate and how much passion was put in every piece of this beautiful collection. Louis used colorful stretch fabrics with a mix of prints in the details, making the pieces look crisp and flattering. • What is your inspiration for your Ensembles’ Collection designs? It was inspired by a lot of things from architecture to graphic art to my favorite movies. I played with a lot of lines and shapes & cutout prints to make it really graphic & playful. • What is your favorite piece from the entire collection? I love the diamond collection, I love how beautifully graphic it is. • How do you feel about this collaboration for a capsule collection with Ensembles? Well I always wanted to collaborate with a local women’s label and I’m just so flattered that I was invited to do a capsule collection. I want these dresses and cute skirt. 2nd from the left dress is my favorite! :) Also lovin' the print on the 4th dress. You can visit their websites for more info.